As a director, Clint Eastwood is generally occupied with contemplative exploration of emotion and nuance, often told in a jazzy lower key (think Bridges of Madison County, Million Dollar Baby or Flags of Our Fathers), which makes him an odd choice to helm the adaptation of the long-running Broadway crowd pleaser Jersey Boys. But in peeling back the bombastic stand-up-and-dance qualities that made the live musical so popular and mining the biopic for its nerve center, he has fashioned an effective cinematic adaptation (B+) that explores the ups and downs of music making, the bounds of loyalty and the exuberance of a splendid time and place. The popular music is still there and serves the story, but Eastwood trusts an almost reverse “inside voice” instinct in spotlighting the Rashomon-like account of how the individual members of The Four Seasons rose from shady petty crime origins to chart toppers. 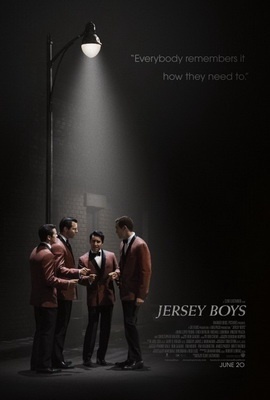 John Lloyd Young is effective as Frankie Valli, the heart of the piece. His character battles demons and heartbreak that give growing gravitas to his distinctive angel voice. Vincent Piazza is also strong as the tough guy with mob roots who takes the band to the brink. The period detail and art direction in a near-sepia that emphasizes tones of silver, is gorgeous in its retro muted effect, like you’re waltzing into a Whurlitzer. The melodrama is sometimes laid on thick, as is the old-age makeup (Clint, did you learn nothing from J. Edgar?). And the narrative wraps up a little too tidy with what feels like a closing credits music video tacked on with a completely different and more buoyant mood than the preceding film. Still, it’s recommended for folks who enjoy how art is put together, how relationships withstand adversity and how songs become a sensation. Much more a film with incidental music than a “Capital-M Musical!,” it’s nonetheless absorbing and awakens unexpected senses.